Is There Religious Freedom in China? 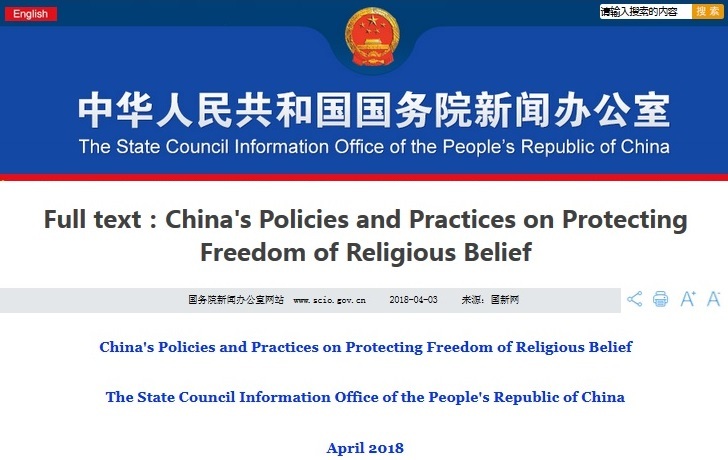 On April 3, 2018, the Chinese Communist Party published a white paper titled, "China's Policies and Practices on Protecting Freedom of Religious Beliefs" and posted its English translation at http://www.scio.gov.cn/zfbps/32832/Document/1626734/1626734.htm. This is the first expression of the Chinese government's vision and policy on religious "freedom" in more than 20 years. Its key clauses are quoted below in blue and analyzed to ascertain if they express the intent to protect China's freedom of religious beliefs or to keep China free from religious beliefs. "China adopts policies on freedom of religious belief, manages religious affairs in accordance with the law, adheres to the principle of independence and self-management, actively guides religions to adapt to the socialist society..."
Since the Chinese Communist Party defines socialism in China, actively guiding religions to adapt to the socialist society means religions will receive "active" guidance - i.e., orders - to "adapt" to the Chinese Communist Party's ideologies and policies. "Actively guiding religions in adapting to the socialist society means guiding religious believers to love their country and compatriots, safeguard national unity, ethnic solidarity, be subordinate to and serve the overall interests of the nation and the Chinese people. It also means guiding religious groups to support the leadership of the CPC and the socialist system; uphold and follow the path of socialism with Chinese characteristics; develop religions in the Chinese context; embrace core socialist values; carry forward China’s fine traditions; integrate religious teachings and rules with Chinese culture; abide by state laws and regulations, and accept state administration in accordance with the law." Since the Chinese Communist Party decides what is in the "overall interest of the nation," being "subordinate to" and serving those interests means being subordinate to and serving the Chinese Communist Party, including its "leadership," "the socialist system," embracing "core socialist values" and upholding and following "the path of socialism with Chinese characteristics." "The General Provisions of the Civil Law states that a lawfully established place of worship qualifying as a legal person may register for the status of legal person to accept donations." In other words, only officially registered Three Self churches, which are blanketed with face recognition-enabling CCTV cameras, can take up offerings, which the unregistered underground churches cannot take up. "The Regulations prescribe the rights and responsibilities of religious organizations, places of worship, and religious believers when establishing places for and holding religious activities, setting up and running religious institutions, applying for legal person status, publishing and distributing religious books and periodicals, receiving donations, managing religious property, conducting charity activities, and carrying out exchanges with other countries. The Regulations prohibit the commercialization of religions, and include additions concerning religious information services on the Internet." "Foreigners may attend religious activities at temples, mosques, churches, and other sites for religious activities. They are also permitted to preach at places of worship when invited to do so by Chinese religious bodies at or above the provincial level." Chinese provinces have up to 100 million people. The only "foreigners" to be "invited" by someone at that "level" are very well-known pastors, who return home and cite their invitation to preach as evidence of religious freedom in China, thereby serving the propaganda interests of the Chinese Communist Party. "Foreigners who conduct religious activities within China shall abide by Chinese laws and regulations. They shall not establish religious organizations, set up religious offices and sites for religious activities, run religious institutions, or recruit foreign students studying in China without authorization; nor shall they recruit followers, appoint clerical personnel from among Chinese citizens or engage in other missionary activities." In other words, an American in China cannot share the Gospel even with American "students studying in China without authorization" from the Chinese government. "The State requires the registration of places of worship for group religious activities in accordance with the law, so as to provide legal protection and ensure that all activities are carried out in an orderly manner." All underground churches are in violation of this requirement. "Chinese religious groups must conduct religious activities in the Chinese context, practice core socialist values, carry forward the fine traditions of the Chinese nation, and actively explore religious thought which conforms to the reality in China." "Core socialist values" includes atheism, which is diametrically opposed to the Gospel of Christianity. And since the Chinese Communist Party defines "the reality in China," Christianity cannot "conform" to it. "Throughout history, different religions in China have blended together and drawn lessons from one another to become an integral part of traditional Chinese culture. In modern times, different religions respect and learn from each other, and take part in exchanges and dialogues, and a new realm of 'five religions (Buddhism, Taoism, Islam, Catholicism and Protestantism) working together to achieve harmony' has taken shape." If "throughout history, different religions in China have blended together," why does China still have "five religions," all of which are over a thousand years old? "According to General Secretary Xi Jinping’s report at the 19th CPC National Congress held in 2017, China will fully implement the Party’s basic policy on religious affairs, uphold the principle that religions in China must be Chinese in orientation and provide active guidance to religions so that they can adapt themselves to the socialist society." In other words, religions that do not become "Chinese in orientation" and that do not "adapt themselves to the socialist society" will suffer the wrath of Xi Jinping, who needs to heed the Gospel just like any other mortal.